Arsenal striker Yaya Sanogo set for Ajax move Arsenal striker Yaya Sanogo is set to leave Arsenal as he is set for a medical tomorrow ahead of his move to Dutch side Ajax on a one year loan deal. Arsenal striker Yaya Sanogo is set to leave Arsenal as he is set for a medical tomorrow ahead of his move to Dutch side Ajax on a one year loan deal. 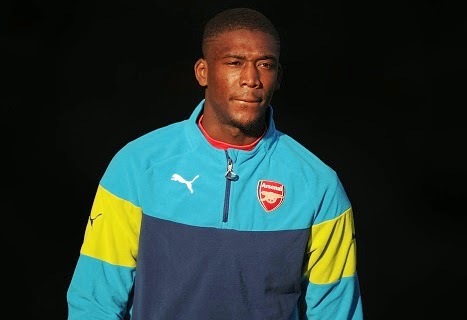 Yaya Sanogo spent last season on loan at Crystal Palace, however he failed to prove himself. This time Dutch side Ajax has agreed to sign him on a one year loan deal. The reports from Daily Star have claimed that the young French striker will be having a medical on Thursday ahead of his loan deal. The player will be unveiled as an Ajax player on Friday. The young striker scored a goal for the Gunners in 20 games for Arsenal last term. Arsenal manager Arsene Wenger who is a big admirer of Sanoga is now set to sell him if he fails to shine at Ajax. While, the 22-year-old is hoping to prove himself in the Dutch so that he can get the regular spot at Emirates Stadium in the future. Meanwhile, Arsenal are looking to sign some strikers this summer after their struggling last season in front of goals. Olivier Giroud and Danny Welbeck both failed last season and could now be facing a struggling season as the Gunners are linked with Real Madrid's Karim Benzema and Napoli's Gonzalo Higuain.